Manager Mike Ford admitted it was a difficult decision to release Conor McDonagh. But something had to give once the Banbury United boss signed striker Leon Lobjoit on-loan from Northampton Town for the remainder of the campaign. McDonagh joined the Puritans in September, 2016 from Oxford City and made 84 appearances, scoring 31 goals in the process, which was not a bad return for a striker who was quite often used wide this season. 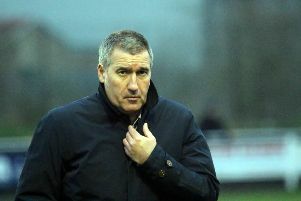 Ford said: “We needed a bit more quality up front, Conor McDonagh worked very hard for us – as do all my players – but I needed to get something different up front. Looking back on Tuesday’s draw with Basingstoke, Ford said the game summed up his side’s season. United went into the game on the back of Saturday’s 5-0 victory over basement boys Gosport Borough in which Ricky Johnson completed a second half hat-trick. But United were unable to make it maximum home points and Ford added: “Tuesday’s game summed up our season, Jack Harding tends to have very little to do yet we seem to end up drawing or losing games. It was a decent goal for their equaliser but again we’ve let a team back into it in the last ten minutes of a game. Meanwhile, Ford said Jack Finch will almost certainly be ruled out of the next two games after picking up a knee injury against Gosport on Saturday.